Part of what makes a library and archives collection interesting is being able to see beyond the obvious uses for the material in the collection. By thinking outside the box, you can sometimes see that there may be other uses for material that, on the surface, seems intended for one use. I'm thinking here of Masonic lodge histories and the banquet menus that are sometimes contained within them. If one takes even a cursory glance at the history of Freemasonry, one will see that the banquets and feasts that continue to be a part of Masonic tradition today have taken place since the earliest days of organized Freemasonry. Masonic banquets and feasts are held for many different occasions. One of these occasions is an anniversary - often the anniversary of a lodge being chartered. In our collection we have a number of individual lodge histories, historical accounts usually published by the lodge itself based on its own records. These are very useful for researchers interested in the history of a particular lodge, its members, and its activities over the years. In addition to historical information about a lodge, many of these books also publish information about the various anniversary celebrations that took place, often coinciding with the publication of the lodge history itself. One of those activities was usually a large, formal banquet dinner. How are food shortages during wartime reflected in the menus? How are now-commonplace technological advances (the ability to freeze foods, for example) reflected in these menus? How do the menus reflect the availability or popularity of various ingredients or dishes? Or perhaps, like me, one might just get enjoyment at looking at a menu from a banquet dinner held over a hundred years ago, and seeing both familiar and unfamiliar items on the menu. 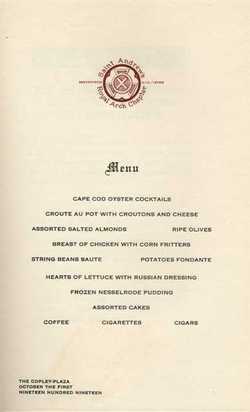 You can compare this menu to the one pictured at the top of this post, which is the menu from the banquet served for the 150th Anniversary of the St. Andrews Royal Arch Chapter in Boston on October 1, 1919. If you're interested in this topic, we have more menus in our Archives collection, in addition to those that might be found in our book collection. Those menus in our Archives collection are generally found with a group of Masonic Dance Cards (MA 015). These elaborate menus occur frequently on "Ladies Night". Bon appetit! Centennial of Mt. Lebanon Lodge, A.F. and A.M. Boston Mass. 1801 - June 10 - 1901. Boston: Printed for the Lodge, 1901. Exercises Commemorating the One Hundred and Fiftieth Anniversary of the Organization of St. Andrews Royal Arch Chapter, Boston, Massachusetts, October the First, Nineteen Nineteen. Boston: Published by the Chapter, 1920.